Another Rapid Static Concrete Batching Plant Upgrade for Hoddam. County Armagh, Northern Ireland, 25 August 2016 – Rapid International Ltd (County Armagh) has recently supplied Scotland based Hoddam Contracting Co. Ltd with a newly updated Rapid 90B static concrete batching plant, capable of producing outputs up to 70 m3 per hour (continuously). The static concrete plant is located at the company’s Ecclefechan site and is employed in the production of ready mix concrete and concrete block making. Established in 1958, privately owned Hoddam Contracting Co. Ltd is the largest concrete block manufacturer in South West Scotland. The company operates two sand and gravel quarries in Southern Scotland and a third site at Ecclefechan, comprising of its concrete production and head office facilities. 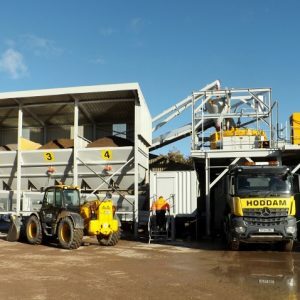 Hoddam Contracting produces a wide range of aggregate and concrete products, including, washed sand and gravels, sub bases, ready mixed concrete, concrete blocks, concrete paving and kerbs. Hoddam Contracting began manufacturing concrete blocks in the 1960s and now supplies throughout Scotland and the North of England. The company initially began manufacturing blocks using a mobile plant but have since progressed to the use of a modern static concrete batching plant plant. 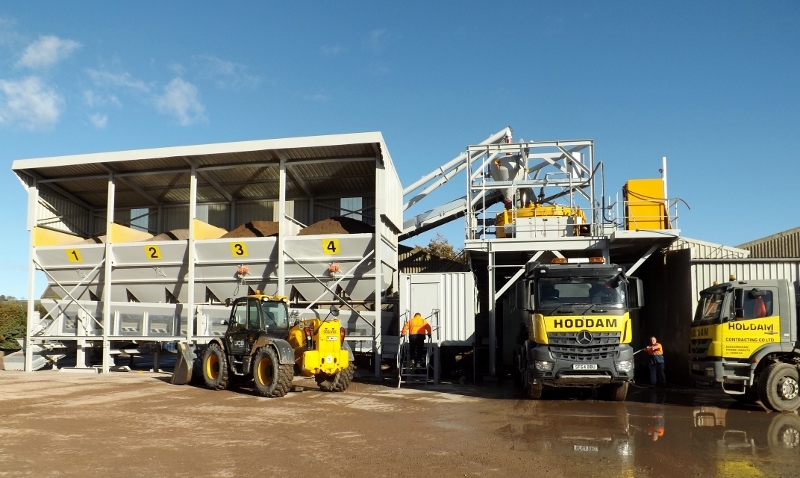 As a prior customer, Hoddam Contracting were confident in their decision to select Rapid to update their previous static plant. The company’s previous plant had reached the stage where it was requiring regular maintenance, so the decision was made to upgrade to a more modern, cost effective solution. Enter Rapid, who three years prior had supplied Hoddam Contracting with two new cement silos. Pleased with Rapid’s workmanship Hoddam Contracting selected Rapid for the static plant update. Rapid updated every aspect of the plant, with the exception of the recently supplied silos as previously mentioned. The extensive upgrade work comprised of an almost entirely new plant replacement, including bins, weigh belts, mixer platform, an R3000 Rapid pan mixer, CWH water weigher and PIL control system. Rapid worked closely with Hoddam Contracting at each stage of the process, troubleshooting any issues, to ensure that the plant was installed and running to their absolute satisfaction. Rapid’s static batch plant range is specifically designed for ready mixed concrete and precast producers. Each plant is supplied pre-wired and in modular sections, minimising site installation. Erection and commissioning of the plant can occur in as little as 3 days. Fitted with a Rapid R3000 pan mixer, giving an output of 3m3 per batch, the Rapidmix 90B offers the potential for readymix, block or precast production from a single plant. The Rapid 90B is capable of achieving outputs of up to 70 m3 per hour in continuous production. Rapid’s mixing technology expertise spans almost 50 years. The company manufactures a comprehensive range of pan, planetary and twin shaft concrete mixers, mobile continuous mixing plant and mobile and static batching plant. Each Rapid machine is produced in its 50,000 square foot purpose built factory. The company takes great pride in its manufacturing capabilities, which incorporates lean manufacturing, and possesses the latest, most technologically advanced equipment. Quality and longevity are at the very heart of Rapid’s machinery. Address: Hoddam Contracting Co. Ltd, Hoddam Road, Ecclefechan, Lockerbie. DG11 3BY.